In the gold mines of Sinktu and Thabait Kyin, in the Mandalay division of Myanmar, gold mining is famous. Over thirty gold mines are active, but the scene doesn't look much like wealth. 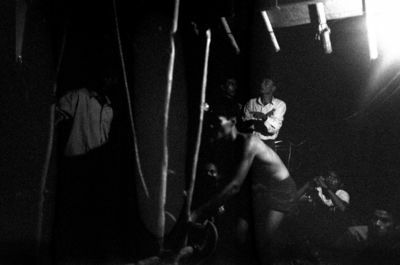 Half naked men, with rusty pneumatic drills and homemade dynamite are lowered 500 feet, on fraying ropes, into holes in the ground. Covering their faces with rags, they drill gold ore from the stone. “We break the rocks with high pressured guns, but breathe the small particles that come from breaking the stone. We contract lung infections that we call "gun disease," says Wat Tay, 35, a gold miner from Sintku Township. This year gold production in the area has doubled due to softening government sanctions and international demand. Myanmar's huge mineral deposits are seen as key sectors in export-driven growth. In recent months the price of gold has slowly risen in Myanmar, possibly linked to the decline of the dollar, as an opportunistic public sell their jewelry at high prices ready to buy back if prices drop. Forums are being held in capital cities by the Myanmar government, mine owners, and the Ministry of Mines to persuade foreign investment from corporate companies for industrial technology. The idea is to reduce Myanmar's poverty rate from 26 percent to 16 percent by 2015, by exporting the country's gold reserves. However, added demand for export means an increased need for manpower, working hours, and medical support. Through the night groups of men squat above mine shafts, ankle deep in muddy puddles, waiting to haul out ore or winch up their friends. After working in the mines for around ten years, the worker's lungs give in form undiagnosed diseases. Hidden in bamboo huts, attached to oxygen, they weaze out their last days. “The owners of gold pits don't care about the health issues of the miners, so the health problems are increasing. They don't pay for safety protection for us, so we make do ourselves, like putting some clothes over our mouths, or buying cheap masks to reduce the dust we breath in,” says Wat Tay. Miners are given one or two bananas after a shift in the tunnels, to help with nutrition. But no respiration equipment is provided by the mine owners, and the miners don't have the money to invest in equipment themselves. 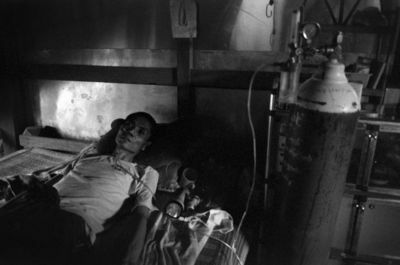 Although cases are frequent, perhaps inevitable, there is no health care system for the miners and no diagnosis of “gun disease.” Instead they are given a tank of oxygen and left to fend for themselves, too weak to seek other employment or to leave their huts. “I can't breathe well. If I breath my abdominal muscles are tight and it hurts also in my back. I pain feel when I breathe. Twice they've given me pills for Tuberculosis, but this medicine has no effect for me,” says Kwin Tone Sel, 42. He used to mine in Sintku Township, before his lung disease prevented him from leaving his bed. Sintku Township, Mandalay Division, Myanmar, 2013. 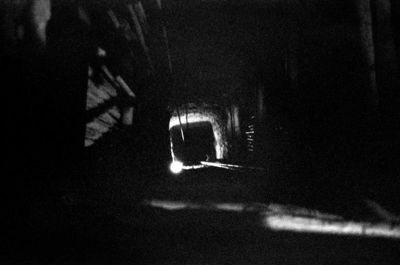 An active gold mine shaft at night. Miners work around the clock to meet increasing demand for domestic and international exportation. Sintku Township, Mandalay Division, Myanmar, 2013. 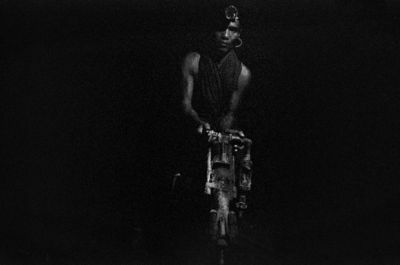 Wat Tay, 35, shows the pneumatic drill that he uses to break rock in the tunnels. 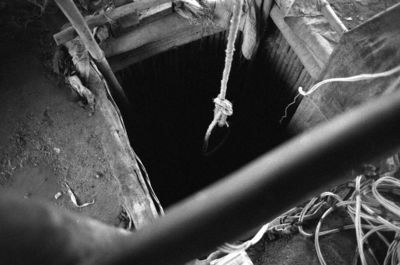 He carries the drill, slung over his solder, as he's winched 500 feet into the mine shaft. 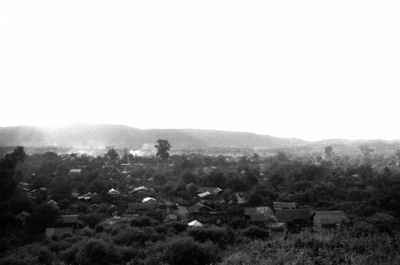 The gold mining village of Sintku Township, Mandalay Division, Myanmar. Gold mining is the major industry here, with over 30 mines in the area. Sintku Township, Mandalay Division, Myanmar, 2013. Wat Tay, 35, readies himself to descend. 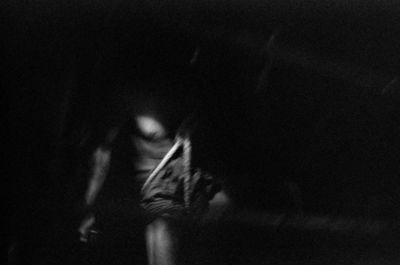 Because of the heat and dust in the tunnels, he wears very little clothing. Around his waist is a frayed rope harness. Sintku Township, Mandalay Division, Myanmar, 2013. Kwin Tone Sel, 42, lies in his home on the edge of the mining village. He contracted "gun disease" years ago, and has been deteriorating since. Apart from his oxygen tank, he receives no other medical attention. Sintku Township, Mandalay Division, Myanmar, 2013. A gold miner pans crushed ore to separate gold flakes from the rest of the stone. 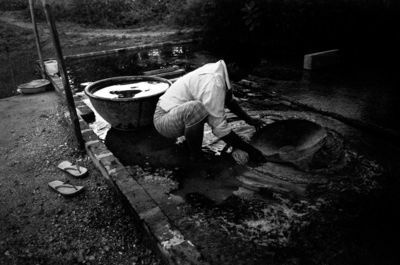 Workers collect the residue from the machine process, panning it at home, to make a little extra profit. Sintku Township, Mandalay Division, Myanmar, 2013. 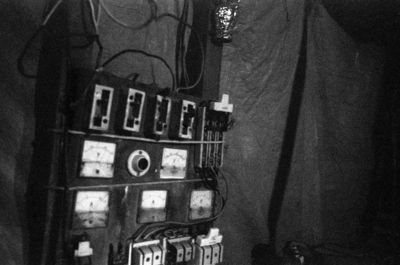 A winch control panel, with radio to communicate with the miners. As the controller hoists the workers to the requested height, the electrical contacts spark in the darkness. Sintku Township, Mandalay Division, Myanmar, 2013. Groups of men wait above the shaft, making dynamite, lowering workers, and hauling up ore.
Sintku Township, Mandalay Division, Myanmar, 2013. The opening of one of hundreds of similar shafts.